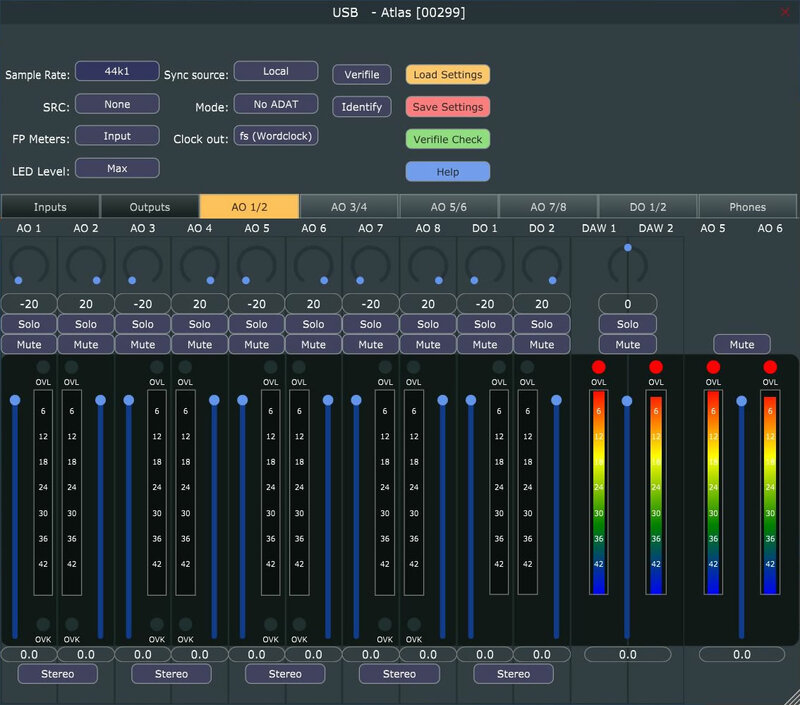 Lyra's hardware front panel gives continuous visual indication of the unit's main settings and levels, but in-depth control is managed from the Lyra Controller applet. This runs on the host computer, and can be popped up whenever adjustments are needed. The upper area of the applet shows a panel of 'Global' settings for the entire group of connected interfaces and a panel of 'Unit' settings which is assignable to each connected unit in turn, using the enclosed drop-list. These settings are concerned with general parameters such as sync source and sample rate selection, metering and buffering modes. An 'Identify' button causes all the LEDs on the selected box to light, to assist with identification in multi-unit systems. To the right, there are large buttons for loading and saving setups, and for on-line help. The function of the lower area of the applet is determined by the row of tabs above it. These tabs allow the lower area to be switched between Input and Output Setup pages, Mixer pages for each output and a block diagram page (which contains a navigable diagram of the functions of the selected unit). The Input Setup page is divided into individual channel 'strips'. Analogue input strips show an indicator of whether mic, line or instrument is connected, and the remainder of the strip changes context accordingly. Line input strips show a high-resolution meter, with overload indication, and a +4/-10 sensitivity selection. An 'OVK' button activates the 'Overkiller' soft limiter, whose momentary operation is indicated beneath the meter. Instrument inputs have the sensitivity switch replaced with a slider control which adjusts the gain of the preamplifier in 1dB steps (indicated in the box beneath). Mic inputs also have a slider gain adjustment, as well as buttons for phantom power, high-pass filter, 20dB pad and phase-reversal, as well as a mid/side (M/S) matrix function (Lyra 2 only). The digital input has a coaxial/optical selection (Lyra 2 only), plus an 'unlock' indicator and a warning indicator for asynchronous input stream (SRC active). The line output strips in the Output Setup page show a high-resolution meter with overload indication and a +4dBu/-10dBV output level selection. The digital output strip has selectors for wordlength, dither mode (flat dither, or SNS 1 thru 4 noise-shaping) and (if the SRC is selected) output sample rate and sync source. Metering is also provided for the stereo headphone channel. The upper part of the page contains a row of assignment buttons for the monitor volume control, which is located on the front panel of the unit. Assigned output channels are subject to the action of the volume control, which is also indicated and controlled from the applet page. 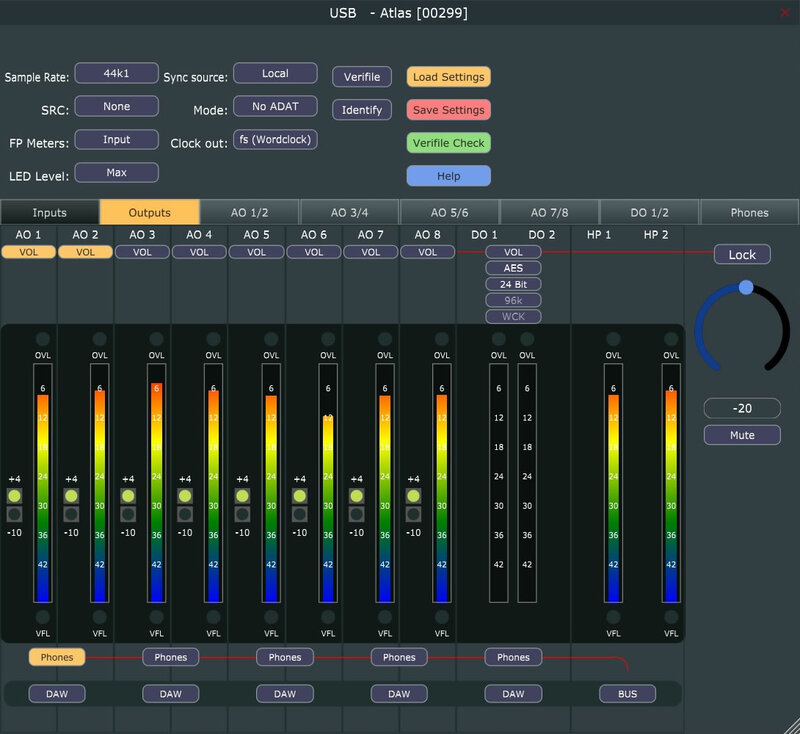 At the bottom of the page, each output pair has a DAW/Mixer selector, which causes it to be driven either directly from the respective DAW feed, or from a local foldback mixer controlled by the appropriate applet page. The headphone output also has a 'Bus' mode, wherein it can be switched to follow any of the other output pairs. Each output pair has a dedicated mixer page, which is activated when the DAW/Mixer selector on the Output Setup page is set to 'Mixer'. 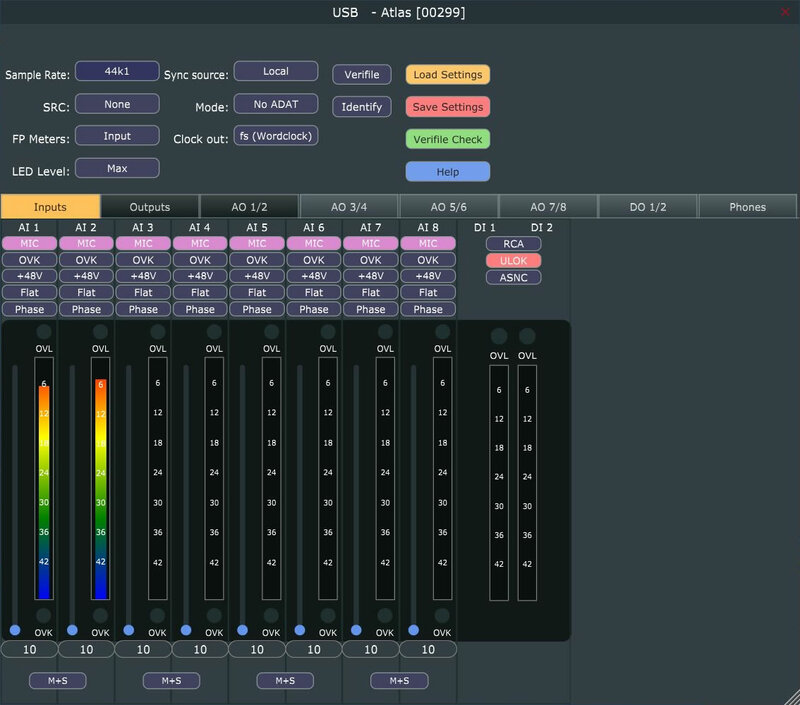 On the mixer page, each channel (including the master output) has a fader and high-resolution meter. Input channels can be operated in stereo or mono mode, and have pan/balance, mute and solo controls. Analogue input channels also have Overkiller activity indicators.